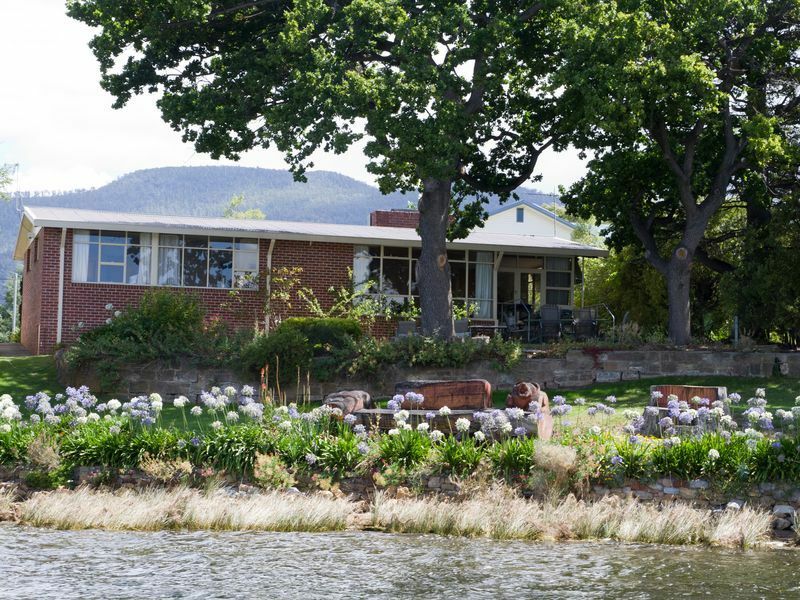 Derwent Hideaway is a fully furnished self contained house with absolute waterfront on the Derwent river 15 minutes from Hobart. Derwent Hideaway has three bedrooms which sleep up to 9 and one baby with a configuration of a queen, double, two singles, a folding sofa bed and a drawer bed in the lounge. The bathroom has a separate toilet and wash basin and there is a fully equipped brand new kitchen and laundry. Basics like tea, coffee, linen and towels are provided as well as extras including a barbecue, fishing gear, TV, DVD, wired and wireless internet and stereo etc. All main rooms have wonderful views of the Derwent River and Mount Direction. It has a large riverside garden dominated by two ancient oaks and at the rear there is a large pet enclosure. Tea coffee and other basics as well as all linen and crockery are provided. Bikes and canoes are available on request at your risk. The property is surrounded by water and there is parkland on the other side of Harbinger Lane. The local Yacht club and launching ramp and shops are close by and easily accessible. Derwent Hideaway is close to major businesses and tourist attractions, public transport and the Brooker highway which is the main route to and from southern Tasmania. Very close are MONA, Alpenrail, Bonorong Park, the Cadbury factory as well as bowling and golf facilities. Derwent Hideaway is rented short to medium term at competitive rates and is suitable for business people looking for somewhere to stay, a retreat or quiet place to work or holiday makers keen onsampling the many attractions that the Hobart region is famous for. Pets are welcome at Derwent Hideaway but not inside. There is an enclosure suitable for compatible animals. The sofas are very comfortable! Bathroom with shower and separate toilet/handbasin. Second toilet. Computer and desk supplied. Cable and wireless broadband are available at no charge. A book swap library. CD's and videos available. A local call only telephone is not provided. The property is not fully wheelchair accessible according to Australian standard AS 1428. It may suit people with limited disabilities depending on whether assistance was available from others in the party. There is one step to the front and side doors. All rooms are then at the same level. The shower has an entrance lip, wide door and a safety bar. The showers are not suitable for wheel chairs and shower heads are not removable. Hand rails are installed in the main toilet. All door frames are standard size. The property has a modern fully equipped kitchen with microwave, hotplates, stove and fridge. The laundry has a washing machine and dryer. There is a separate barbeque area with a second dining table and chairs. All linen and crockery are provided and there are TV's, stereo etc. electric heaters for warmth, wireless broadband and large garden dominated by two historic oaks planted by Lady Franklin with a great outdoor area for relaxation. Sailing down to Tasmania? We have our own mooring for customers and there is a public jetty close by. Ample notice is required and a fee applies if you wish to use it. Maybe getting a little tired but wonderful spot and very clean and tidy. Would recommend. The property is generally marketed as a 1950's Some people like older rather than modern ticky tacky and plastic houses! Such an interesting historic location. Great place for our beautiful fur baby Beatrice.So close to an off leash dog park. We were able to exercise her morning and night.Lovely views of the river the bird life was so great to watch in the morning and evening.It was a good location to explore the city of Hobart and the west east and south of The Derwent river. The bed was very comfortable and the towels and linen were really good. John the owner was a very good communicator. We thought the cleaners could have done a better job and the yard needed a lot of work . We had a lovely relaxing stay and appreciated being able to have our Beatrice stay with us. Great house with all you need, rustic charm with a beautiful view. We just loved this place! It is period and has many original features, but the main reasons we loved it was that has a million dollar view. It is absolute waterfront as you can see from the photos. You look out over the river with boats moored right out front waterbirds swim around and at night the lights on the water are absolutely beautiful. It is like going home with that lovely comforable, relaxing feel. There are shops nearby and parks to walk in. It's tucked away in an internal block so there is no traffic noise - it's sooo quiet! A great place for families and your dog! John was so flexible and helpful, extended the stay as we needed. Greatly appreciated! Nice and cosy and a great view from the garden.